Many visitors traveling along the southern coast of Iceland are so intent and excited to see Iceland’s iconic Jökulsárlón Lagoon that they blow by one of Iceland’s other nearby national treasures, Skaftafell National Park. Yes, you should definitely see Jökulsárlón Lagoon but also be sure to allocate enough time to visit nearby Skaftafell as well. We found two of the easiest and most spectacular hikes of our trip here. I would plan at least 4 hours to complete the two hikes, because you’re guaranteed to stop repeatedly to take zillions of photos! The first hike (more like a walk) leads to an impressive close-up view of a glacier; and the other hike is a loop hike passing waterfalls, stunning vistas of glaciers and mountains, and quaint Icelandic turf-roofed houses. Skaftafell is located 57 km (about 50 minutes) west of Jökulsárlón Lagoon and offers a number of hiking trails for all skill levels. The trailheads to both of these easy, short hikes start from the Skaftafell Visitor Center. Follow the Ring Road to its intersection with Route 998 (Skaftafell sign) and follow it 2 km. Turn right after the entrance to reach the Visitor Center parking area. As a bonus, the Skaftafell Visitor Center is also worthy of your time. The Visitor Center provides excellent information about the trails, exhibits about the geology of the area, and a short 12 minute movie shows footage of the dramatic glacier flood from Skeiðarárjökull (glacier) in 1996. You’ll also find a souvenir shop, restrooms, and a cafeteria next door. Important: Make sure to stop in the Visitor Center before your hike to pay your parking fee (750 ISK) at the kiosks on the wall and get trail conditions. The Visitor Center opens at 9am in May and 8am June-September. This short 3.7 km (2.3 mile) roundtrip walk is an easy way to get close to a glacier. The flat trail starts next to Skaftafell Visitor Center and is well marked. It is paved half the way and then becomes a wide, crushed gravel surface. The trail ends in close proximity of Skaftafellsjökull where you will get a good view of this impressive glacier. Plan on about 90 minutes for this walk including time for photographs. This hike is wonderful. It’s especially well-suited to kids because of its constantly changing features and views along the trail. Plus, it’s a relatively short loop hike at 5.5 km (3.5 miles). Estimated walking time is 2-3 hours depending on how long you linger at each magnificent viewpoint. The trail leads you to 3 stunningly beautiful sites: Svartifoss waterfall (Icelandic for “Black Falls”), the incredible viewpoint at Sjónarsker with 360 degree views of the surrounding glaciers from a high vantage point, and finally a stroll among the old turf-roofed houses at Sel before returning to the Visitor Center. The loop hike is a well-marked trail and also begins next to Skaftafell Visitor Center. The first 250 meters passes by the campground and then turns right and starts climbing uphill. Along the way, you’ll pass 3 other waterfalls before arriving at Svartifoss after 1.5 km. Upon reaching Svartifoss, you’ll find a viewing platform for a closer look at this rare waterfall surrounded by black hexagonal basalt columns. The basalt columns here are reportedly the inspiration for the Hallgrímskirkja church in Reykjavik. After admiring Svartifoss, continue across the river on the footbridge and climb up the rock steps on the other side of the ravine. Continue uphill on this trail for about 1 km to the viewpoint at Sjónarsker. You’ll see a sign for Sjónarsker and a trail on the right which leads you up a short steep hill to the viewpoint. At the viewpoint, you’ll have amazing 360 degree views of Skaftafellsjökull (“jokull” means glacier in Icelandic), a wider view of the Vatnajökull, the distant lava fields and river, and the mountains. A steel viewing disc indicates the natural landmarks that you see in each direction. It is definitely worth the walk to get here. It’s simply awesome! From Sjónarsker, retrace your steps to the main trail. From here, it’s all downhill. You can follow a trail to return directly to the Visitor Center or follow the signs to Sel (recommended) where you’ll walk by a few turf-roofed houses on your way back. As you loop around and go past the turf houses, you’ll be on a wide gravel road for a short distance before rejoining the trail system. When the road bears left to a small parking area, look for the Lambhagi Trail sign. Follow the Lambhagi Trail which takes you back to the Visitor Center after crossing the water a few times on a series of footbridges. Continue to follow Lambhagi signs, and you’ll eventually pass the campground and arrive at the Visitor Center for a total of 5.5 km (3.5 miles). Svartifoss-Sjónarsker-Sel Loop Hike-Map courtesy of openstreetmaps.org. You’ll find a cafeteria located next to the Visitor Center as well as a food truck, Glacier Goodies, serving lobster soup and baby back ribs. Shell Freysnesi Gas Station is located on the Ring Road just outside of Skaftafell National Park. Don’t scoff at eating at gas stations in Iceland. Enjoy the hot dish of the day as well as burgers and pizzas. Hof 1 Hotel provides a Family Room with 4 twin beds. Make sure to reserve the family room that has a private bath. It has an onsite restaurant, free breakfast, and WiFi. Skaftafell National Park is 11 miles from the hotel while Jökulsárlón is 25 miles away. Average nightly rate is $380. Hali Country Hotel has 2 cottages that sleep 5 and both offer a full kitchen and WiFi. A 2 bedroom apartment with ocean view has 2 queen beds and a sofa bed. The other 2 bedroom cottage has 1 full bed, 2 twin beds, and a sofa bed. Jökulsárlón Glacier Lagoon is 7.5 miles away and Skaftafell National Park is 55 minutes away. Breakfast is included and the hotel has an onsite restaurant for dinner. Average nightly rate is $473. Fosshotel Glacier Lagoon has an excellent location and would be our first choice in terms of amenities. However, it only accommodates a small family of 3 or you would have to book two standard rooms for your family of 4. The same goes for nearby Hotel Skaftafell. 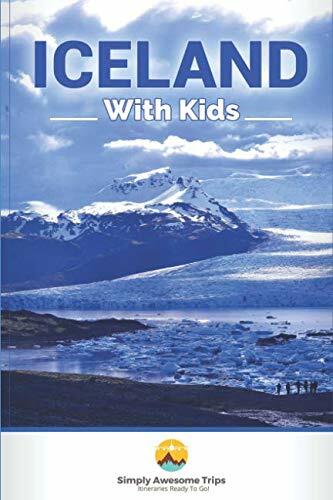 Along with the hikes mentioned here, you’ll find all the information you need for your summer road trip along the southern coast of Iceland in our latest guidebook. The best stops and sights to visit are detailed along with dining and lodging options near Vik, Hof, and Reykjavik--all with travel tips learned along way. Special Offer for those who loved this blog and want to know more. Receive a Simply Awesome Trips Iceland itinerary sent directly to your email. Everything you need for a stay in Reykjavik and journeys along the southern coast of Iceland. A $10 dollar value is yours free! We absolutely respect your privacy and do not share email addresses with anyone else. No spam. Thank you! The itinerary will be sent directly to your email. Enjoy!